For a while now I’ve had a goal of doing an “around the world” series inspired by the best skate video of all time, Menikmati. Not to sound like a crotchety old skateboarder, but they just don’t make ‘em like they used to. Everything in that video, from the intros to the music to the map pinpoints (and, oh yeah, the skating), was brilliant. Skateboarding was undoubtedly a global phenomenon by the time Menikmati debuted, but nobody quite captured the sensation of a skateboarding diaspora like French Fred. While every single video part would have arguably been suitable for curtains, Koston’s stands the test of time. His Thai kickboxing and meditation footage makes for an approachable intro… and then he goes on a 5-minute killing spree starting with BCN’s Sants and ending with perhaps the most photogenic trick ever done at Bricktown. Watch it as many times as you want; this ode to skateboarding (and to the polarizing K3) never gets old. 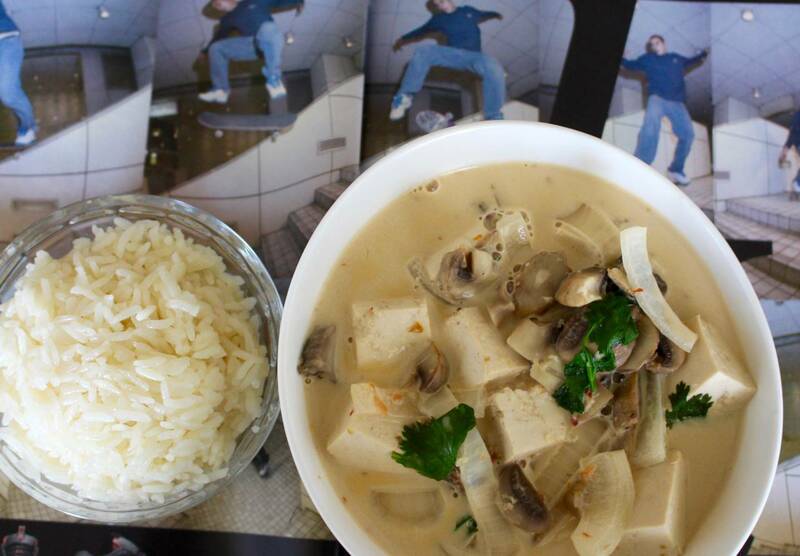 In the vein of celebrating Menikmati’s international roster and Koston’s intro, this week’s recipe is a Thai coconut soup called Tom Kha Phak. 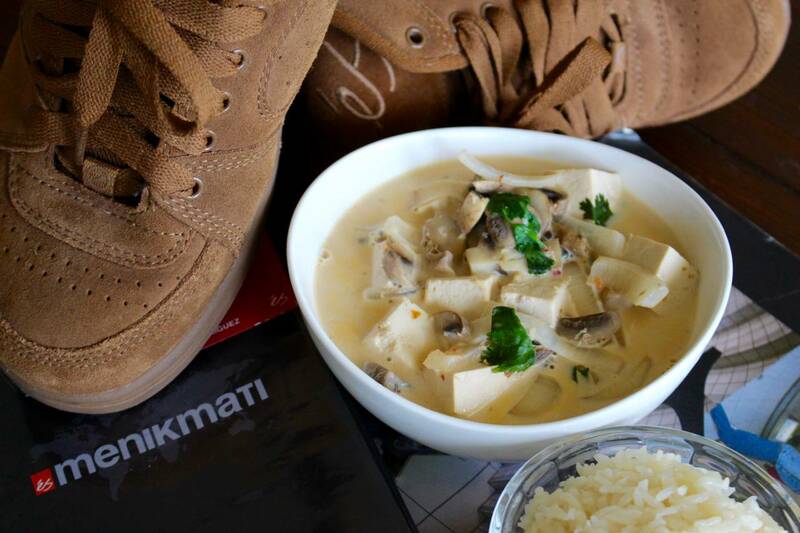 If you’ve never had Tom Kha, it’s essentially a Thai stew made with a base mix of coconut milk and broth and spices like lemongrass and galangal. It’s a wonderful balance of spicy, sweet and sour and, when made with tofu and served with rice, can be an excellent post-sesh source of protein and carbs. While the recipe below is undoubtedly delicious, keep in mind that this soup is very customizable. Don’t like mushrooms? Choose another veggie. Not big on spicy foods? Take out the crushed red pepper and reduce the chili paste. Just like a tre flip, there are a thousand styles of Tom Kha, and no one is better or worse than another (but Kalis definitely has the best tre steez). First thing’s first, press and drain that tofu. While that’s going on, pour the vegetable broth in a skillet and reduce it by half. Contrary to the famed comic about reducing wine, to reduce means to boil it down to half its volume, not drink it. While that’s reducing, cut up your lemongrass and grate your ginger and toss them into a medium pot. Using a fork or masher, mash the lemongrass pieces so that they give a little and release some flavor into the pot. Take note of how sturdy lemongrass is; do not eat it. It’s not poisonous or anything, but it does not taste good and it’s very hard to chew, so just let it do its thing and don’t chomp down on it when you’re eating the finished product. 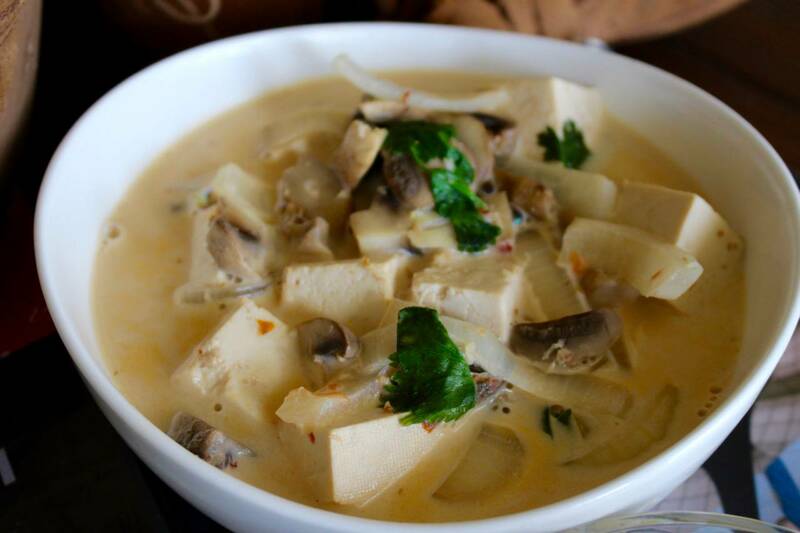 Once the broth is reduced, add it to the pot with the ginger and lemongrass and pour in the coconut milk. Bring to a simmer and then toss in the onions and mushrooms. While that simmers for about 5 minutes, chop up your tofu into cubes and then toss it into the pot with the chili paste and simmer for another 5 minutes. Lastly, add the lime juice, soy sauce, maple, cilantro and crushed red pepper and let it simmer for a couple more minutes. 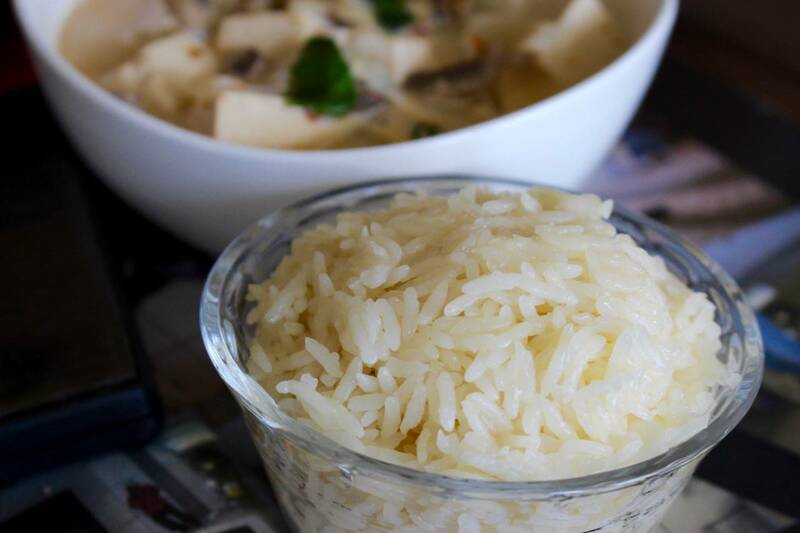 Remove from heat and serve with (or on top of) your choice of rice! Go watch some old Koston videos.